The Great Barrier Reef Is Apparently Indestructible… But Still Doomed | Watts Up With That? Thirteen thousand years ago, as the last ice age ended, entire stretches of Australia’s Great Barrier Reef perished. Rising sea levels blanketed the world’s largest collection of corals with sediment coming off the newly inundated land, blocking the sunlight corals need to grow. The reef eventually recovered, but it took hundreds to thousands of years. This near death and eventual resurrection wasn’t a one-off, according to a new study that reveals the reef’s shifting boundaries over geological time. It’s a tale that has played out five times over the past 30,000 years—and it may be happening again today. The study “holds some really important lessons” for understanding how resilient corals are in the face of change, and how quickly they recover after catastrophic events, says Kim Cobb, a paleoclimatologist at the Georgia Institute of Technology in Atlanta, who wasn’t involved in the work. Today’s rate of sea level rise is moderate—about 10% of the rate 13,000 years ago—but going forward it may accelerate dramatically, she says. But the reef couldn’t always keep up with changing sea levels. The researchers identified five times when it appeared to die off—twice during the cool down of the last ice age, when falling sea levels exposed corals to air; and three times 10,000 to 17,000 years ago, when glacial melt caused sea levels to rise rapidly. “We haven’t drilled or sampled everything,” says Webster, so he and his colleagues can’t confirm how extensive the die-off was. But they think corals persisted in some places along the continental shelf during those times, allowing reefs in other locations to re-establish within 2000 years. The historical die-offs are similar to “what we’re seeing right now on the Great Barrier Reef,” says Mark Eakin, a coral reef ecologist at the National Oceanic and Atmospheric Administration in College Park, Maryland, who wasn’t involved in the study. My first thought was, “No schist Sherlock.” The Eemian coral reefs of Florida are currently located in onshore quarries. Florida’s coral reefs of the Last Glacial Maximum are dead and buried in deeper water than Florida’s current coral reefs. Coral adapts. Coral moves. Coral has a far better handle on climate change than NOAA ever will. My second thought was, WTF? The only logical takeaway from this study (and reality) is that coral adapts, coral moves, coral has a far better handle on climate change than NOAA ever will. How in the hell could anyone interpret this as indicating that coral is more fragile than previously thought? Or that somehow, coral can’t adapt to the “Anthropocene”… When it readily adapted to far more dramatic climatic changes over the past 30,000 200 million years? A few years ago, the coral reef experts at the World Bank proclaimed that coral could not survive at CO2 levels above 550 ppm. Coral reefs, which protect against coastal flooding, storm surges, wave damage, and also provide homes for lots of fish, are doomed on our current course, says the World Bank. Coral reefs are dissolving because of ocean acidification–the more CO2 in the atmosphere, the more gets dissolved in the oceans. 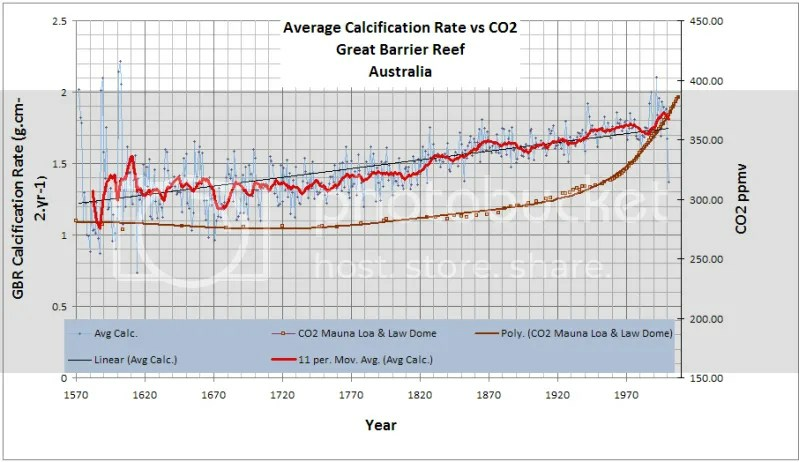 The illustration shows the impact on coral reefs at various CO2 levels. Coral reefs may stop growing as CO2 concentration levels approach 450 ppm, which is expected over the coming decades. By the time the concentration reaches around 550 ppm in the 2060s, coral reefs will start to dissolve. Scientists, presumably with straight faces, claimed that greater than 550 ppm CO2 was doomsday for coral reefs. No wonder the Great Barrier Reef keeps coming back from the dead. It boggles the mind. Today’s rate of sea level rise is moderate—about 10% of the rate 13,000 years ago—but going forward it may accelerate dramatically, she says. Pacific Mystery: Coral Reefs Are Thriving, But How? A College of Geosciences researcher and her colleagues have found healthy coral reefs in highly acidic ocean waters. “The reefs appear to be thriving, and we want to understand why,” says Kathryn Shamberger, assistant professor of oceanography. The team examined eight coral reefs in the Palauan archipelago and found high levels of acidification within the lagoons and inlets of the Palau Rock Islands. But despite the high levels, the Rock Island coral reefs appear to be extremely healthy. “Based on lab experiments and other studies, this is the opposite of what we expected,” says Barkley, the lead author. The team says that the acidification process in Palau is a natural one, due to a combination of biological activity and the slow flushing of water through the Rock Island lagoons that allows acidification levels to build up over time. Rapid rates of coral reef growth have been identified in sediment-laden marine environments, conditions previously believed to be detrimental to reef growth. A new study has established that Middle Reef – part of Australia’s iconic Great Barrier Reef – has grown more rapidly than many other reefs in areas with lower levels of sediment stress. A recent survey of the Coral Sea and Great Barrier Reef has found coral flourishing in deep waters, a stark contrast to the shallower reefs that have seen a drastic decline over the last few decades. The healthy coral populations were discovered to be below 30 meters — beyond the usual reach of most scuba divers — and even found at depths of 80 meters, according to the Catlin Seaview Survey. Researchers are surprised at thriving coral growth at Rottnest Island, predicting its smaller coral communities could grow into a reef similar to the one that existed there in the Last Interglacial, approximately 130,000 years ago. Amid major developments, territory’s scientists make unexpectedly pleasant underwater discovery. Marine life is thriving despite major developments at Hong Kong’s busy harbour. WILLEMSTAD – A recent two-week long scientific assessment surveyed over 150 dive sites of Curaçao’s shallow water reef sites and found signs of healthy coral and fish populations around the island, particularly in Oostpunt. The scientific assessment was a critical step in Blue Halo Curaçao and its comprehensive, science-based approach to ocean zoning. The susceptibility of reef-building corals to climatic anomalies is well documented and a cause of great concern for the future of coral reefs. Reef corals are normally considered to tolerate only a narrow range of climatic conditions with only a small number of species considered heat-tolerant. Occasionally however, corals can be seen thriving in unusually harsh reef settings and these are cause for some optimism about the future of coral reefs. Here we document for the first time a diverse assemblage of 225 species of hard corals occurring in the intertidal zone of the Bonaparte Archipelago, north western Australia. Jardines de la Reina, a vibrant marine preserve, is thriving even as other ocean habitats decline. The sharks are a tourist attraction — at two of the many diving spots in the Gardens, they are fed to ensure larger numbers — but to scientists like Dr. Pina and Dr. Kritzer, their very presence here is an indicator of the coral reef’s robustness. Research has linked the health of reefs to habitation by large fish, and the absence of sharks and other top predators is often a sign of a reef in decline. The resilience of this coral reef seems beyond question. The waters inside the preserve hold 10 times as many sharks as outside, Dr. Pina said, and goliath grouper, rare in many places, are often seen here. Mummies, they’re called, these strange shapes that form one of the largest structures ever to exist on Earth. Stretching some 2900 kilometers from Spain to Romania, the long, sinuous curve of millions of mummies—once-living, vase-shaped animals—is a fossil reef. In its heyday in the Jurassic, the reef dwarfed today’s Great Barrier Reef off Australia’s northeastern coast. Now it is visible only in rock outcrops dotted across a vast area of central and southern Spain, southwestern Germany, central Poland, southeastern France, Switzerland, and eastern Romania near the Black Sea. The ancient reef was made up not of corals but of deep-sea sponges called hexactinellids. Hexactinellids, or glass sponges, use silica dissolved in seawater to manufacture a skeleton of four- or six-pointed siliceous spicules. Individual glass sponges, such as the beautiful Venus’s flower-basket sponge (Euplectella aspergillum), are still found in the deep sea but are a different genus and species from the Jurassic reef-builders. Reef-building glass sponges, known only from fossilized remains, are thought to have gone extinct 100 million years ago, driven out by competition from newly arrived diatoms. Then came an odd clue at the bottom of Hecate Strait. During a 1984 seafloor mapping expedition, scientists from the Geological Survey of Canada, using sonar imaging, saw mounds over huge areas of the seafloor—areas that should have been completely flat. Similar acoustic anomalies, as geological survey scientists Kim Conway and Vaughn Barrie referred to them, were observed again in 1986 during a survey of Queen Charlotte Sound. Reef-building glass sponges gave up their secret to Conway and Vaughn in 1987: underwater photography in Hecate Strait captured the sponges on film. Far from extinct, the sponges were thriving in the depths off British Columbia. MUSANDAM // A survey of the peninsula by an expedition of marine scientists and volunteer divers has found that its coral reefs are thriving. For Dr Jean-Luc Solandt, an expedition member and one of the authors of the report, said when it came to the health of corals, the sites were in better condition than many locations famous for being scuba-diving haunts. The healthy Musandam reefs could well be a source of population recovery for reefs in the Arabian Gulf, where physical and man-made factors combine to create an environment that is more challenging for corals. Many of the sites hosted very large colonies of the genus Porites. Some of the colonies, said Dr Solandt, were “the size of small houses”, indicating they could well be more than 400 years old. This also most likely meant that no significant damaging events had occurred within this timeframe, said the report. Maybe coral reefs don’t like scuba divers??? SAN JUAN, Puerto Rico – As the ocean floor plunges off southwestern Puerto Rico, it reveals coral reefs dotted with bright-blue sea squirts and a multitude of other organisms whose existence has given hope to scientists who strive to save the island’s threatened ecosystems. The organisms are an integral part of a group of reefs discovered to be thriving near an area where most shallow coral reefs and the fish that depend on them are in poor health overall. The reefs – at a depth of up to 500 feet (152 meters) in an area 12 miles (19 kilometers) across – were recently discovered as part of a federally funded mission to conduct research on deep-water corals, according to the U.S. National Oceanic and Atmospheric Administration. “We stumbled across this area,” Richard Appeldoorn, a professor at the University of Puerto Rico in Mayaguez who was involved in the mission, told The Associated Press on Thursday. Divers enrolled in a one-year training course to depths of up to 100 feet (31 meters) noticed the thriving reefs and large predators lurking nearby, said Appeldoorn, who oversees the university’s fisheries, biology and coral reef studies program. [C]orals in American Samoa are actually thriving despite the heat. At least that’s what researchers at Stanford University reported recently in the Proceedings of the National Academy of Science. Steve Palumbi is a professor of Marine Science at Stanford University and a lead author on the research. He explained how corals bleach and otherwise react to the stresses of heat. Penn State researchers and their international collaborators have discovered a diversity of corals harboring unusual species of symbiotic algae in the warm waters of the Andaman Sea in the northeastern Indian Ocean. “The existence of so many novel coral symbioses thriving in a place that is too warm for most corals gives us hope that coral reefs and the ecosystems they support may persist — at least in some places — in the face of global warming,” said the team’s leader, Penn State Assistant Professor of Biology Todd LaJeunesse. For at least fifty years, agitated academics have been predicting the end of Australia’s Great Barrier Reef. Now international “experts” are also sprouting coral calamity. But despite the alarms, the reef is still there. Corals are among the greatest survivors on Earth and have been here for about 500 million years. Many of the types of corals found on reefs today were present in similar forms on reefs 50 million years ago. Since corals first appeared there have been five mass extinctions when over 50% of all life forms on land and in the seas died. Corals also survived several deadly ice ages when sea levels fell so low that many coral reefs left their skeletons stranded as limestone hills on dry land. But always some colonisers followed the retreating seas and survived. Then came the hot climate eras when the great ice sheets melted and sea levels rose dramatically. Some coral reefs drowned, but others just built on top of the old drowned corals forming the beautiful coral atolls we see today. Corals flourish in gently rising seas such as we have today – it gives them room to refresh and grow vertically. And if the water gets too warm, coral larvae just drift into cooler waters closer to the poles. The Great Barrier Reef would move slowly south. Corals have outlasted the dinosaurs, the mammoths and the sabre-toothed tiger. Captain Cook’s ship was almost disembowelled by the sturdy corals of the Great Barrier Reef in 1770. If Cook came back today, he would be unable to detect any changes in the Reef. No matter what the future holds, corals are more likely than humans to survive the next major extinction. In the event of yet another Ice Age we must hope that reef alarmists have not denied us the things we will need to survive – food, energy, chemicals, shelter, concrete and steel generated by carbon fuels. CANBERRA (Reuters) – Coral is again flourishing in the crater left by the largest nuclear weapon ever detonated by the United States, 54 years after the blast on Bikini Atoll, marine scientists said on Tuesday. A team of research divers visited Bravo crater, ground zero for the test of a thermonuclear weapon in the remote Marshall Islands on March 1, 1954, and found large numbers of fish and coral growing, although some species appeared locally extinct. “I didn’t know what to expect, some kind of moonscape perhaps. But it was incredible,” Zoe Richards, from Australia’s James Cook University, told Reuters about the team’s trip to the atoll in the south Pacific. “We saw communities not too far from any coral reef, with plenty of fish, corals and action going on, some really striking individual colonies,” she said. Additionally, there was no significant correlation between calcification rate and seawater aragonite saturation (Ωarag). These results suggest that the impacts of ocean acidification on corals physiology may be more complex than have been previously proposed. GALVESTON, Texas — When you think about Galveston, you probably picture sun and surf, maybe the Pleasure Pier or sometimes seaweed, but you probably don t think about great diving. The sanctuary actually encompasses three separate areas, underwater salt domes that stand higher than the surrounding ocean floor. Snapper and grouper fishermen who saw the colorful sponges and other marine life under their boats are credited with discovering the ecological wonder in the late 19th century. The area was designated as a national marine sanctuary in 1992 and it s now managed under the direction of the National Oceanic and Atmospheric Administration. At a time when coral reefs around the world are in decline, Flower Garden Banks is thriving largely because it s so remote it attracts comparatively few divers. I’m really beginning to think that the only thing coral reefs can’t handle are too many scuba divers. What is so special about Little Cayman’s reefs? That’s the question a new $140,000 scientific study at the Central Caribbean Marine Institute will seek to answer. Scientists want to determine why reefs around the remote island are thriving and whether there are lessons that can be adapted to help protect and maintain vital coral reef systems around the world. The new study will look specifically at rare and endangered coral species around Little Cayman and attempt to determine why they are bucking a trend of widespread decline in coral reefs across the Caribbean. An earlier study by CCMI showed that coral cover had been increasing around Little Cayman over the past five years. What is so special about Little Cayman’s reefs? Here’s a SWAG… They are REMOTE. Recent ‘extreme’ weather events, rising carbon dioxide levels and the growing evidence of retreating glaciers have increasingly become the subjects of much debate in the popular press and numerous fields of scientific research. Driving these discussions are questions aimed at discerning what drives the climate on Earth. Several have been noted in previous research: Milankovitch cycles, solar output, continental configurations and the most recent and controversial, carbon dioxide and other greenhouse gas atmospheric concentrations (Hambrey 2004). In order to understand what we should expect, both from a climate change perspective and from a changing biogeographical perspective during our current interglacial phase, scientists have looked to the last interglacial period in the geologic record, the Sangamon Stage (or the Eemian, as it appears in European literature) approximately 114,000 – 130,000 years ago for answers. Similarly, the limestones deposited in coral reef complexes near Bermuda, the Florida Keys and part of the Miami Limestone had to have been formed in seas that are anywhere from 6 to 19 meters higher than current sea level with most sea level estimates being placed at 6 – 10 meters higher than today. These values represent data gathered during 2 of the lower sea stands during the Sangamon with the 3rd being much higher than the others based on ?O18 minimums obtained from oxygen isotope data of deep sea cores (USGS). The implications of such a high sea level suggests that massive changes in a number of the elements that factor into establishing a particular global climate regime had to have occurred. Looking at Milankovitch cycles, the Northern Hemisphere, during the Sangamon, would have received higher insolation rates (solar radiation received on a surface during a unit of time) than today and a large portion of Greenland’s Ice Sheet and significant portions of the West Antarctic Ice sheet would have had to melt to produce the sea level rise necessary for coral reef derived limestone formations to have been generated at the elevations that they are present at today (Koerner). Carbon dioxide concentrations weren’t as high in the Sangamon as they are today, but they were still much higher than any of the previous or following glacial periods. This combination of high CO2 and increased insolation due to Milankovitch cycle parameters would have altered the climate regimes around the globe. Global temperatures were thought to be 5-7 °C (9-13 °F) higher than the current interglacial period according to North Atlantic oceanic sediment cores with South Pacific oceanic cores showing a rise of only 3-5 °C (5.4-9 °F). Across the majority of Europe, general scientific consensus was that the Eemian climate was much warmer and wetter than today’s environment. This resulted in the development of vast temperate forests and the rapid expansion of species, most notably Carpinus across the area (Turner 2000). Although the Eemian was consistently much warmer, evidence has been building that a large scale late Eemian arid ‘pulse’ dominated central Europe resulting in the widespread takeover of ecological niches by various grasses and shrubby bushes before returning to a warm, somewhat more moist climate dominated by temperate forests just before the most recent glacial stadial (Sirocko, et al. 2005). Coupled with the climatic discrepancies are the discrepancies with analyzing how life will respond to the changing environment. As Smith and Buddemeier explained, looking at oceanic chemistry and a number of other factors, a rise in sea level could actually benefit most coral reef complexes if sea level and atmospheric carbon dioxide concentrations rise at anticipated rates within the next 100 years. The net effect would cause a drawdown of atmospheric carbon dioxide as more of this greenhouse gas gets incorporated as CaCO3 as various reef complexes grow. Overall, Smith and Buddemeier make a valid point when they explain that the number of factors affecting coral reef health and viability, coupled with the modest changes expected from various climate change simulations indicate that on a global scale, coral reefs are unlikely to be adversely affected by projected climate change. It is only on the local scale that coral reef communities could be at risk. Fortunately for coral reefs, there were no scuba divers 130,000 years ago. In the deep waters of the Gulf of Mexico, approximately 250 km west of Cape Sable, Florida, and 70 km west of the Dry Tortugas, are a series of drowned barrier islands known as Pulley Ridge. The ridge was found in 1950, but it wasn’t until recent years that scientists discovered something extraordinary. The southern portion of the ridge is a thriving coral reef, a pristine habitat teeming with life and color. Here, more than 60 species of fish swim in predominantly clear, warm water. An abundance of algae sprinkles the seascape in vibrant reds and greens. Brilliant blue-purple corals stretch across the sea floor like giant plates. Octocorals, with tiny featherlike tendrils and colors that vary per colony, reach out with sometimes light and delicate and sometimes bright and knobby arms. And in the soft light that filters down from the distant surface, luxuriant fields of the leafy algae Anadyomene menziesii rise from the sea floor like patches of lettuce at dusk. The reef was discovered in 1999, as scientists and graduate students from the USGS Center for Coastal & Watershed Studies and the University of South Florida (USF) boarded the research vessel Bellows and set sail for the Pulley ridge area, where a bathymetric map of the ocean floor showed a mysterious bump. Why does it always shock the “scientists” when they discover healthy, thriving coral reefs? It seems as if every newly discovered reef is healthy and thriving… particularly if it is in a remote area and not frequented by scuba divers? How are these remote reefs miraculously immune to Gorebal Warming and Ocean Neutralization? Coral reefs appear to be adapting quite well to climate change and Chicken Little of the Sea, if not adapting so well to scuba divers, snorkelers, agricultural runoff and fishing with dynamite. De’ath, G., J.M. Lough, and K.E. Fabricius. 2009. Declining coral calcification on the Great Barrier Reef. Science, Vol. 323, pp. 116 – 119, 2 January 2009. That’s really funny… Because the PDO supposedly can’t drive anything. It’s just an index of North Pacific sea surface temperatures and Flinders Reef is in the Coral Sea. The PDO and Flinders Reef are on opposite sides of the equator. The low pH levels from 60 mya to 40 mya include the infamous Paleocene-Eocene Thermal Maximum (PETM). Even then, the oceans did not actually “acidify;” the lowest pH was 7.42 (still alkaline). The Eniwetok/Bikini coral reef complex dates back to the Eocene. Oddly enough, there is an unconformity between the Eocene and Miocene. 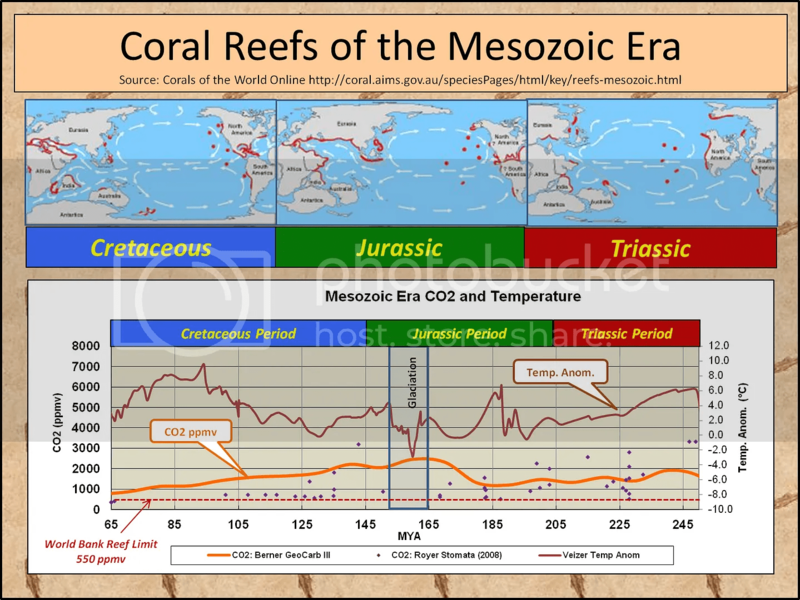 There was apparently little or no coral growth during the Oligocene, a period of global cooling and falling sea level. Reef waters are bad places to measure pH – way too much photosynthesis going on. However, reefs are the only decent source for continuous, high resolution reconstructions of paleo-pH. Open ocean pH time series, like HOTS, show very little pH variation compared to Flinders Reef and of are far too short a record length to identify any of the natural cyclical variability documented in Flinders Reef. There are no measurements of pre-industrial oceanic pH, apart from boron isotope proxies from ancient coral reefs and these show no secular pH trend. Thank you for the effort in making this post. David – so, the reefs will be gone but when conditions return to favorability they’ll grow back in 2000 years? When sea level drops 100 m during the next glacial stage and then rises 100 m during the next interglacial stage… The reef will move. As such, only dead coral will remain at the abandoned previous addresses. Researchers are studying the mysterious lives of creatures in and near Cuba’s coral … Coral reefs there are so pristine that some … environmental conditions. oooops !!! Sorry, Cuba already done. Delete my comment. Yep, a very long, but informative post. Remember that the biggie is the $$ from tourists and being able to snorkel among beautiful coral and associated fish/marine critters. As Carlin pointed out years ago, the coral will just fine. It has gone thru far worse and come back bigger and better. It’s we humans that are gonna go away. Pack your stuff, folks. The coral we look back in ten thousand years and laugh at us. here’s one that surprised me that I didn’t notice above! Wow! You put a lot of work into that. Thank you. The GBR has been around in one form or another for about 1/2 million years. 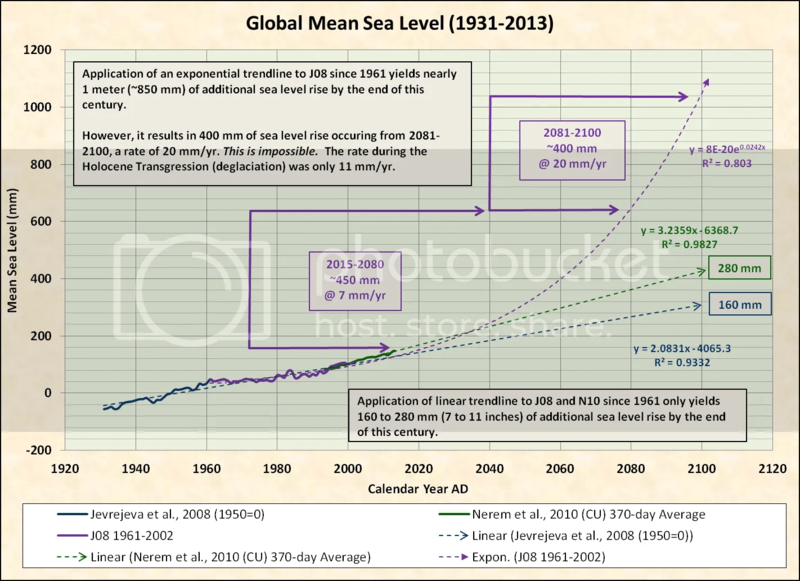 Great drops and rises in sea levels didn’t kill it. Warming oceans and rising SL didn’t kill it. Typhons can’t kill it. Plagues of coral eating fish and star fish haven’t killed it. Changes in ocean pH haven’t killed it. Now the big scare is that sunscreens using BP-2 will kill it. Coral Reefs are better adapted to the real world than is your average climate scientist. The coral reefs at Bikini, a nuclear test site in the Pacific, are T-H-R-I-V-I-N-G.
What is this psychotic need that these people have to meddle with something that can do quite well without their MEDDLING?????? What are these earnest pips going to do when Australia finally gets to the Equator? A small, primitive critter than can migrate at will in the ocean depths does not need their interference. Maybe the bombs eradicated all their bacterial parasites – now they are healthier. The bombs have kept HUMANS away. Some of the most pristine wilderness areas can be found enclosed within military zones not open to the general public. Midway Island is reported to have fantastic reefs, and I suspect some great wreck diving as well (if not too deep). We can and often do “foul our own nests”, but nature easily shrugs us off. Where man does not go wildlife thrives- Chernobyl! Thanks David, I’ll pass this along to a recreational diving friend who tends to worry about coral. He incidentally has a large reef aquarium in his basement. When I saw the picture, I was reminded of Phil Collins and his upcoming “I’m Not Dead Yet” tour. The above are 2 more examples of Junk science that is being produced by 97% of climatologists these days. DM, amongst your better always excellent posts. And yet coral reefs are no match for spin politics and carbon tax crusades. Good, then my investment in AZ beach-front property is gonna pay off going forward! A friend of mine keeps Koi Carp. He’s fastidious about his husbandry, but knows he needn’t be. These fragile creatures are a lot less fragile than we imagine. You see, he created a pond for someone and stocked it with small Koi. The friend lost interest after a year or so and abandoned the project by simply neglecting the pond. Four years went by and my friend was invited in to remove the pond as it was just an algae covered puddle by then. When they pulled the liner out, it was complete with gunge, slime, filth and, Koi Carp the size of the creature from the blue lagoon. He realised then that these things don’t need human intervention to survive. Four years of no water treatment, cleaning, or food, and precious little water unless it rained, and they didn’t just live, they flourished. Ignore the GBR, it’ll be just fine. Carp and other cyprinids are rather special. They are virtually indestructible. I can tell a true tale about a pond in Sweden which had become infested with tench Tinca tinca. First they dosed it with rotenone. Lots of dead tench rose to the surface, but a year or two later they were just as numerous as before. Then they drained the pond. No good, the tench just burrowed down into the mud and survived. Then they drained it in autumn and left it dry till next spring. Still no luck, apparently tench can estivate. Then they drained it a third time and mined it with dynamite and blew the whole thing up. Mud and tench cascaded, but after landing the survivors just wriggled down into the mud again and disappeared. Then they gave up. Hotscot, you are not thinking of the livelihood of our reef scientists, what will they do? Let me see, maybe something non essential like research into a cure for cancer or similar. Corals have pelagic larvae. That means that they release millions of larvae to drift freely with the ocean currents. Nearly all die and it might seem an insanely ineffective way to procreate. But it virtually guarantees that any suitable unoccupied substrate will be quickly colonized. And for a coral larva that happens to settle first on a new volcanic island or a Great Barrier Reef that has been onshore and dead since the previous interglacial it means that it has hit the evolutionary jackpot and will have countless billion offspring. AAAS: “as the last ice age ended, entire stretches of Australia’s Great Barrier Reef perished. Rising sea levels blanketed the world’s largest collection of corals with sediment coming off the newly inundated land.” The whole reef perished, because it was 400 feet above the sea level. Today’s Reef IS that “newly inundated land”. What beautiful sinecures does the AAAS provide. what ice can even melt today. Some of Greenland and a little bit in northern Antarctica? Compare that to the massive mile thick low latitude ice sheets in North America and Europe that melted in the past. There is no possibility of modern melting to exceed the melt rate from the end of the last glaciation. It is absurd to even suggest the possibility. Well baby, then let the oil companies in to make up for the lack of drill holes. 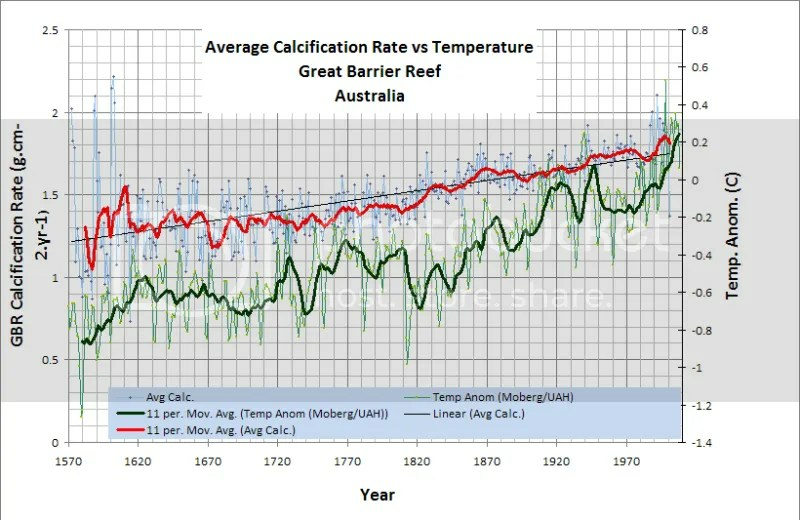 David Middleton ==> Yes, one of the most egregious omissions in the MSM reporting of reef science is that ONLY shallow water reefs are affected by high Sea Surface Temperatures, and thus are the only reefs that are hit by high temp bleaching. Deeper reefs are largely undisturbed. The deeper reefs thus “re-seed” the shallow-water reefs. Anyone who has scuba’d reefs deeper than 10-15 meters knows how fast the water temperature varies with depth. The very warm water right at the surface often floats on a layer of cooler water below. Facts don’t matter. Corals are dying and CO2 is the cause. That is the narrative. Repeat 10,000 times in every news outlet across the planet. Repetition = truth = the New Scientism. Coral reefs emphatically illustrate that adaptation to our ever-changing earthly environments drives evolutionary success. Adapt and Thrive! An intersting fact is that few if any cores through major reef have found coral much older than about 800 000 years. Before that time glacial cycles were only about 40 000 years long, and interglacial were cooler and only lasted a few thousand years. Apparently this wa not enough time to form really large reefs. There have been some monstrous reefs in the past. The Napier Range around Kimberley in Australia is an old fringing reef from the Devonian. And the Guadalupe mountins in Texas is an exhumed part of a barrier reef around the Triassic Delaware Sea. When you stand looking up at El Capitan you are in effect standing on the floor of the Triassic ocean looking up at a barrier reef. El Capitan is waaayyy cool! Great stuff David. Thank you. Something is in error with the timelines – 13,000 years ago and it toook hundreds of thousands of years to recover?? The researchers found that acidification levels in the Palau Rock Islands are as high now as the open ocean is projected to be by the end of this century. So less basic (not acidic at all) by 0.35. I guess the 225% hydrogen ion statement is meant to scare us. The fact is that this not acidic by any definition. Seawater adjacent to active volcanic CO2 vents is still basic. The pCO2 has to approach infinity in order to drop seawater pH below 7 (/slightly sarcastic). So a statement like “225% more hydrogen ions (H+)” is misleading. What he should have said was 56% less concentration of hydroxide ions (OH-). My understanding of the chemistry/biology is that until there are free H+ ions, the critters (coral, shellfish etc with calcium carbonate exoskeletons) will experience little to no effect. Call me when the pH hits 6.9 (or is even projected to reach 6.9). I wondered also about pH. Australia has been reported to actually have real acidified (pH–5.0-6.8) waters in near Gulf salinities from episodic acid sulfate soil runoff in Hastings Estuary, New South Wales. Has rock oysters and mangroves and measurable alkalinity. Was thinking locally, near oceanic salinities were reported to be 31.8-35.4. No, both are extremely sparse. They just aren’t the reagents that matter, and remain so whether the pH is 8,1 or 6.9. What does matter to the critters is the availability of carbonate in solution. And pH 8.1 is already well on the acid side of the equilibrium between carbonate and bicarbonate. H⁺ is an indicator, not a reagent here. As the pH goes below that, carbonate is harder to get. “So a statement like “225% more hydrogen ions (H+)” is misleading”… if it lacks context. If anybody is interested the Hastings data reportedly came from Glaspie, C. N. and R. D. Seitz. 2017. Multiple stressors associated with acid sulfate soil effluent influence mud crab, Scylla serrata, predation on Sydney rock oysters, Saccostrea glomerata. Marine and Freshwater Research. 68:743-751. Don’t know where this is but I have seen oysters from Wooli, NSW, where they raised seed. Oysters are very resilient animals, hard to kill, show sublethal effects first. This sounds more like a restricted polluted place, and back when use of the word pollution was always real, pH was commonly used as one important marker. Salt water chemistry is really, really complicated, especially when you get sediments and organic matter involved. When I have my swimming pool water checked, the “required” pH level is 7.2-7.6, so humble old me can only assume that reducing pH levels in & around coral reefs to anything above 7.0, will do them no harm whatsoever. Alarmists are only in it for the money/power/prestige. David: excellent post. Thank you. I am sure that you will be well aware of the following resource, but others may not be, so I thought it worth highlighting. Click on ocean of interest (e.g. Pacific), then on a specific site (blue triangle, e.g. GAKOA, Alaska), and then on “See real time data graphics for this mooring”. Then wait, perhaps go get a coffee, and finally one or two plots will be displayed (this may be sometime after the “page loading” has disappeared … don’t give up, it’s worth the wait!). The huge variations in “local” oceanic pCO2, both at individual sites and between sites, are very illuminating. Not all sites have pH measurements and even when they do, they are usually quite short stretches. But it’s a lot better than relying solely on the Aloha/HOT values! David, this is an excellent set of data, refuting the view of CO2 as the main factor which determines the pH of sea water. It is interesting that supporters of this theory sometimes refute themselves. the authors say: “Ocean acidification is an undisputable fact. As CO2 dissolves in the surface ocean, it reacts with seawater to form carbonic acid increasing ocean acidity” (p.5). However, in the same book (p.54, table 3.1) one can see real data showing the range of pH in different places 7.91 – 8.46, though “atmospheric P(CO2) is relatively homogeneous over the Earth”. All the arguments about changing the pH of seawater are meaningful only in view of its chemical composition. A decisive role is played by substances forming buffer mixtures: carbonates, bicarbonates, borates, silicates. I haven’t found the data about seawater composition near the Great Barrier Reef. This falls into the “all other factors held equal” category. If you hold equal all other factors and increase CO2, the pH of seawater will drop. All other factors are never held equal in nature. The high CO2 areas are places where upwelling takes place. This is deep water that has not been in contact with the atmosphere for a millenium and where organisms have converted most of the O2 to CO2. This cool, CO2-rich and nutrient-rich water is also the biologically richest part of the oceans and the best fishing areas. It’s also among the most “acidic” seawater… pH generally decreases with depth. Just about every example of shells being pitted by “ocean acidification” is due to upwelling. What you have found is classic DoubleThink. “Doublethink is the act of simultaneously accepting two mutually contradictory beliefs as correct, often in distinct social contexts. Doublethink is related to, but differs from, hypocrisy and neutrality. Also related is cognitive dissonance, in which contradictory beliefs cause conflict in one’s mind. Doublethink is notable due to a lack of cognitive dissonance—thus the person is completely unaware of any conflict or contradiction. h/t to George Orwell and 1984. The take-away (for me, anyway) of the graph showing CO2 ppmv vs. temperature anomaly is that since the Triassic at least, and in the coral proxy record, there’s no correlation between the global temperature and CO2 concentration. Just so alarmists, like, you know, don’t pretend it does. There’s a tiny bit of correlation… Warmer —> More CO2. I liked your focus on the effects of scuba divers as a possible cause of some of the very hyperbolized damage to corals. I m reminded of some years back when the supposedly climate related dieoff of frogs was th cause celebre. In the end the most likely culprit was determined to be researchers who wore the same Wellies when moving from site to site in conducting their research, thereby becoming the prime vector of the diseases that were devastating the frogs. Scuba divers are a big cause of reef destruction. It took about ten years for a dive site to be developed, and by then enough divers had hit the coral to break off everything standing free. The divers do this by blowing the air out of their boyuancy compensator ( the BC Vest). This gets them about ten pounds heavy and they plummet to the bottom of the reef. Hitting fins first. Cannot. See what they are stepping on. Breaks the coral off. Hardly anyone blows half the. BC off and then swims down to the reef in neutral boyuancy to remain floating above the reef. Coral has a far better handle on climate change than NOAA ever will. I think one of the big problems with the warmist view of nature is that they think that nature gives a s**t about human time scales. For example a wildfire burns a forest down (like Yellowstone). Oh no! Yellowstone will never recover! Of course it will, but just not in your lifetime. Nature doesn’t care about you and your sensitive aesthetics. Same with coral reefs. More like a millenial’s time scale. My parents’ generation lived through the Dust Bowl and the incredibly hot summers of the 1930s. They were indelibly etched in their brains. How surprised they would be if they could see how those days were ‘adjusted’ to be cooler than present day. But young people would not understand this. To them every storm is the worst in human history. There is no time like the present. Be very careful with the good news and adaptation talk about corals. It could get you fired in Australia. The aforementioned Flower Gardens in the Gulf of Mexico was once a delta. Suter, J. R., H. L. Berryhill, Jr and S. Penland. 1987. Late quaternary sea-level fluctuations and depositional sequences, southwest Louisiana continental shelf. pp., 199-219, In, D. Nummedal, O. H. Pilkey and J. D. Howard (Eds.). Sea-Level Fluctuation and Coastal Evolution. Special Publication 41, Society Economic Paleontologists and Mineralogists. Read this on The Australian’s website yesterday. Sad, but I had to laugh at the researchers who, after claiming there have been no less than 5 “near-death” episodes on the GBR in the last 30,000 years, including a 118m rise in sea level, still go on to claim that AGW will destroy it in the next century. So Bravo Crater in Bikini Atoll, created by the famous huge 1954 atomic bomb blast by the US is now teeming with healthy coral and fish populations! Time for another pump of the Pearse Axiom: Mankind does not and will never command energy intensity sufficient to cause other than temporary, localized damage on the planet. Bolide strikes, earthquakes, violent volcanic eruptions, and the like dwarf any and all harm caused by human activities. Alarm that our industrial or even war waging activities will cause “tipping points” and other widespread irreversible damage is simply not a plausible notion. Period. Not surprised by this at all. I have a bit of a question more than a comment. I have read coral polyp has a typical lifespan of 2-3 years. If you split this and say an average lifespan of 2.5 years, this would mean an average of 40% of all coral dies annually, yes? 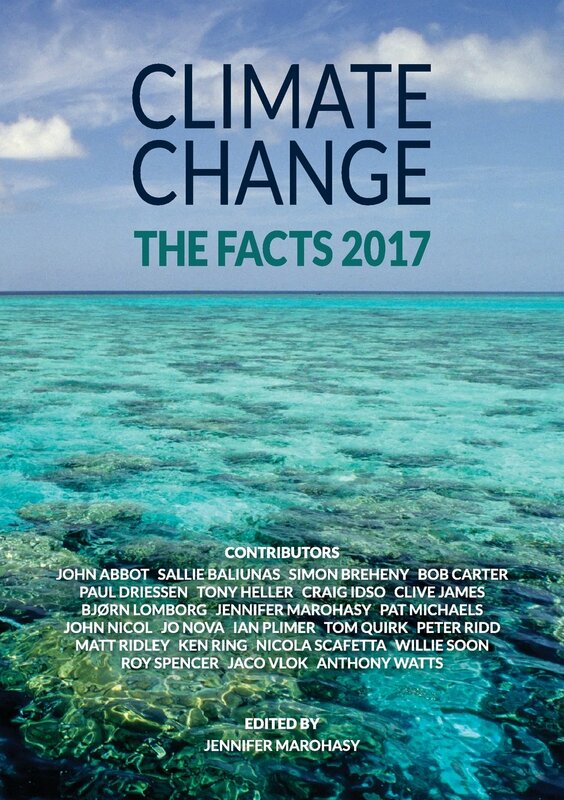 The reason I ask is because The Conversation (and probably every alarmist) is noting in the hardest hit section of the GBR (carefully selected to maximise the figure, of course) the coral death rate was between 47 and 83% (and I would question these figures due to the biased source) with an estimated average of 67%. As coral spawning occurs late in the year, would it not be plausible to say a large portion of this 67% would have died prior to the next spawning regardless and therefore not having as significant an effect on the overall health of the reef? Going by human statistics, the majority of deaths in heatwaves are the sick and elderly and survivors are likely to get right through to the next spawning and probably the one after that too. The second worst affected section was said to have 11-35% of coral die (and southern sections insignificant figures), this of course is less than my calculated average annual deaths so (by my reasoning) little, if any additional annual deaths would have occurred. Is this sound reasoning or am I missing something? It just sounds ridiculous to be worrying about less than the average annual death toll occurring in what is probably the time of year most polyps die anyway (I’ve not researched this, it just seems to make sense that after a spawning and in the harsher temperature range, this would be the time). reef corals, like many other marine organisms, are currently experiencing poleward range expansions , but there is little evidence for range retractions in low latitudes. Yah more coral reefs ! Wow, a truly comprehensive review. And it illustrates that skeptics have been correct. As well it would appear that Prof. Ridd was correct to question the alarmists. 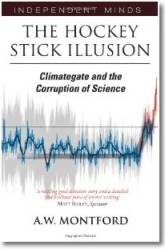 I’m imagining a Monty Python-esque sketch about climate “science”. In 20 years or so, when Warmists become the much-ridiculed flat-earthers, and the Earth’s cooling phase is well underway, they will provide fertile ground for much comedy. Great post thanks David. I always look forward to a DM guest ridicule.